Beyond The Black Rainbow is beyond trippy! 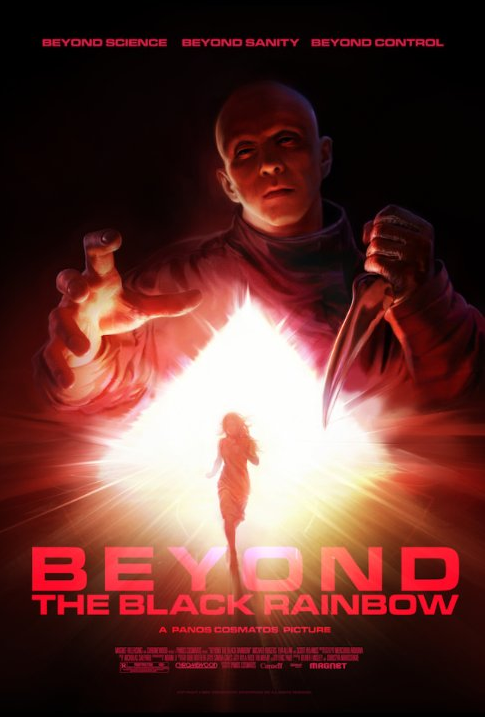 I had Beyond the Black Rainbow on my Netflix “My List” for a long time. Whenever I would scroll thru my list my reaction to the description given on Netflix would be something like “Why did I put this movie on my list? Oh yeah, looked like a nice blend of paranormal, psychological thriller with mind control conspiracy tinged overtones…” But I couldn’t get passed the description referencing the protagonist’s flight from captivity and the subsequent pursuit, which made me think the majority of the film would be a typical chase/hunter/hunted sort of bore. Boy am I glad I took a shot today with this one! Beyond the Black Rainbow is the weirdest, most effective psychedelic film I’ve seen in, well, maybe ever. Imagine, if you can, a film entirely trippier than the last half hour or so of 2001 A Space Odyssey. A film where the use of color and sound are so immersive, even on my old pregnant belly TV, that I couldn’t stay fully awake; forget Beta, I had trouble staying in an Alpha state. I kept finding myself slipping into Theta. I wasn’t tired. I wasn’t bored. The film was hypnotizing me. Literally. Please don’t ask me what was going on – I have very little idea. The film seemed to float in an alternate reality somewhere (hopefully!) far far away in both time and space. I was initially fooled into thinking this was an eighties production and was quite surprised to discover this film was released in 2010. It certainly tapped into that feeling of science fiction from days gone by, in a very real way no less. No pastiche here – this is the real deal all or nothing take no prisoners love it or hate it film style that is all too rare (IMHO). Claustrophobia-inducing is one yucky effect of the film, but even that I have to say is a testament to just how well made the film is to be able to produce such a strong reaction in viewers. (One reviewer on IMDB declared it a heart attack set to film – not far off, in feeling anyway, I’d say). Lovers of science fiction films of yesterday will appreciate many references throughout the film including mention of 1183 (dyslexic 1138 of Lucas fame) and several stylistic effects taken seemingly as tribute from the aforementioned 2001 A Space Odyssey. There was another film which specifically was called to mind whilst I viewed this film, and thinking this was an older film I thought this movie to be the influence to the other, but upon realizing this was from 2010 it turned out to be yet another reference to an older film. I’m not trying to be cryptic, but for the life of me I cannot at the moment recall that film… If I remember it, I’ll edit this post accordingly. The point is, Beyond the Black Rainbow is rife with references to older science fiction films of a certain slow, deliberate and hypnotic quality which some persons (myself included) find all too rare. If you include yourself in this party, and somehow like myself have failed to take notice until now of this great addition to the repertoire, don’t wait any longer. Catch Beyond the Black Rainbow while it’s streaming on Netflix – the way titles appear and (mostly) disappear from there you never know how long it will be available!